Honestly, my friend Dawn makes the best roasted beets. She really does. They’re just perfectly crispy, a little bit salty, and the color is amazing. 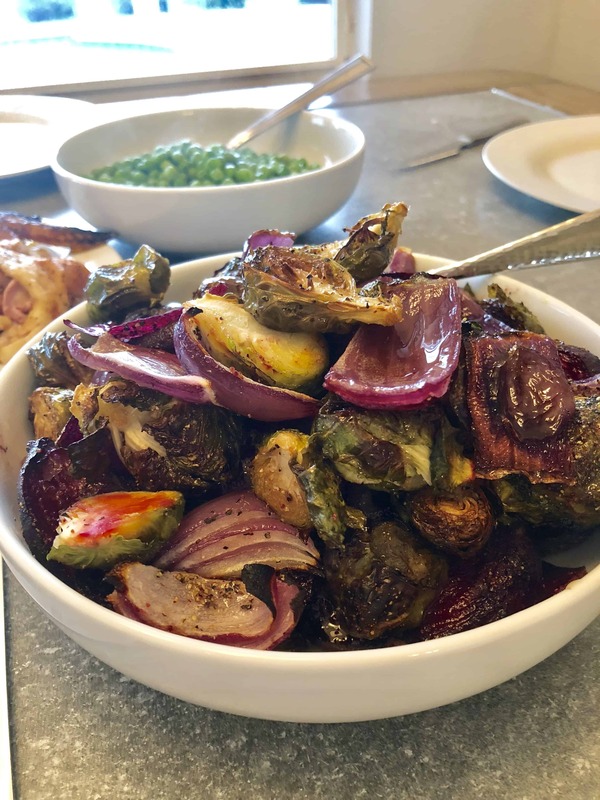 Dawn really has turned me on to roasted beets and my recipe for Roasted Beets & Brussels Sprouts with Crispy Bacon was inspired by her. I have been in the process of developing my Thanksgiving menu, and I really wanted to include a little bit of red and green. I don’t know of any two better vegetables for including red and green than Brussels and beets. Also, I wanted something simple. A dish that I could add to the Thanksgiving menu without adding any stress to the day. 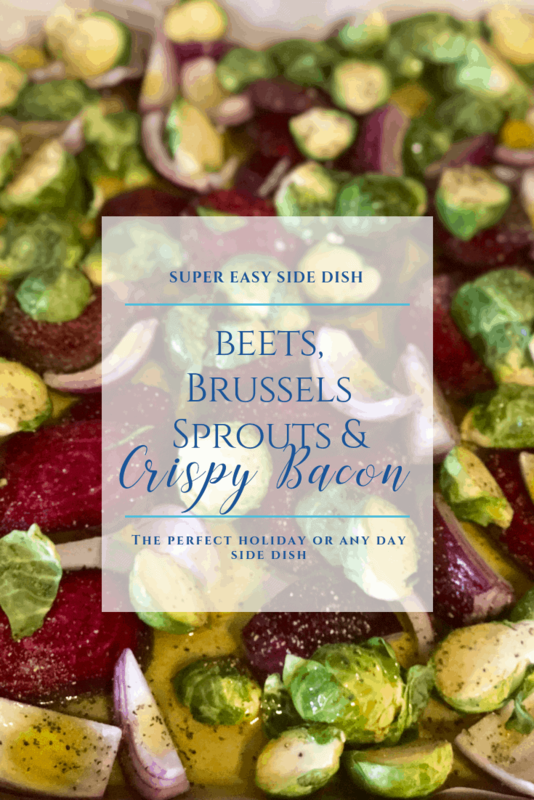 Hence, Roasted Beets & Brussels Sprouts with Crispy Bacon was born. Who Can Resist a Beet?? Just the color and the pattern of beets makes my creative juices start gurgling. 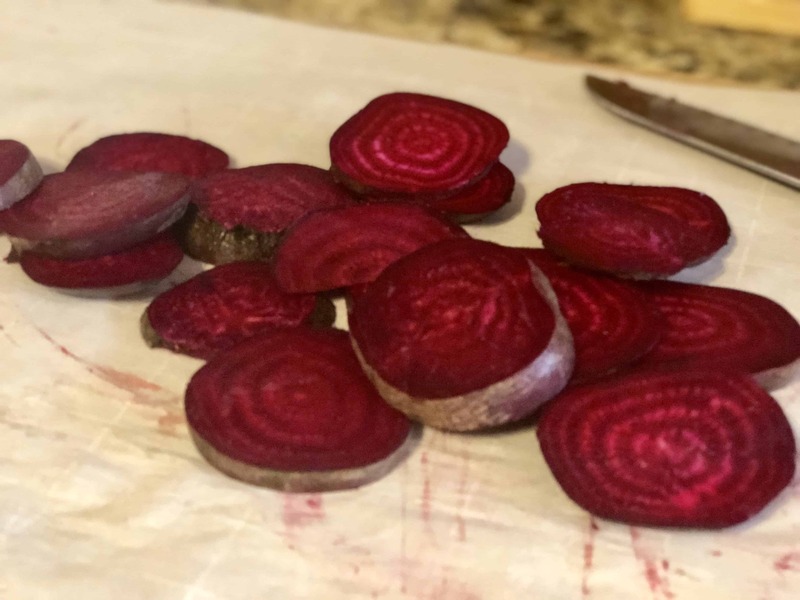 Here’s a tip – cut on a plastic cutting board and follow up by placing the sliced beets onto a sheet pan lined with parchment paper. Cut your beets into medium sized discs. Cut large Brussels sprouts in half. Place both onto a sheet pan. Add red onions for color and a kick. Cover with your olive oil, salt, pepper, and garlic powder. Place into a 375 degree oven for 40 minutes. Remove from the oven and crumble crispy bacon over the top. I’m going with NO on that one. 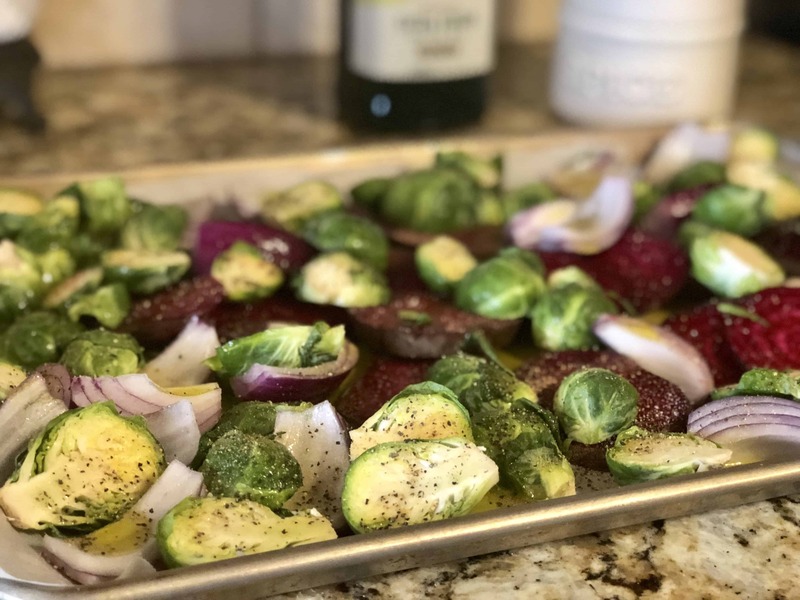 Roasted Beets & Brussels Sprouts with Crispy Bacon is one of the easiest side dishes I’ve ever developed, and I have full intention of serving it on Thanksgiving! I hope I make Dawn proud. Step 2 Place all vegetables on a sheet pan. Step 3 Toss in olive oil & spices. Step 4 Place in 375 oven for 40 minutes. Step 5 Stir together, top with crispy bacon. Step 6 Serve & Enjoy (that was easy, right)? ?